Wooohoo Tuesday! 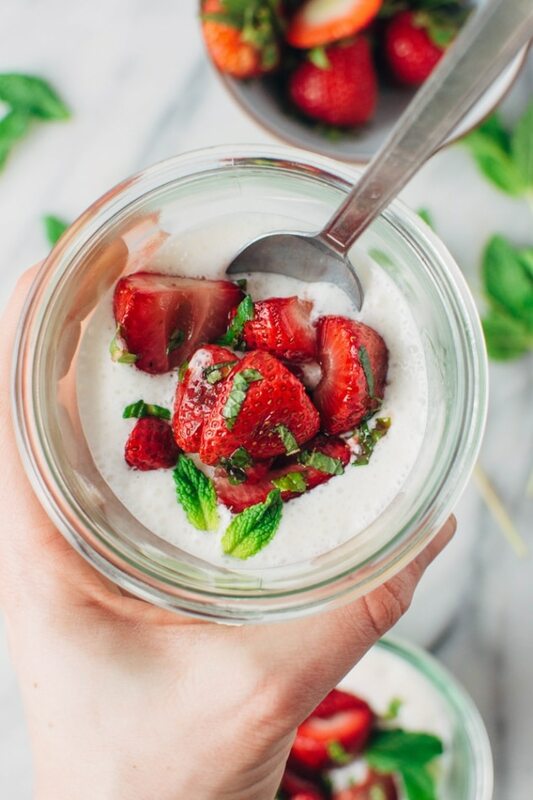 While not normally the most exciting day of the week, we’re gonna embrace the hell out of it today with some roasted strawberries with mint and airy yogurt cream that’s gluten free and refined sugar free bc WE CAN AND IT”S DELICIOUS! IMHO every weekday deserves a healthy indulgence like this. Have you guys every played around with roasting strawberries? 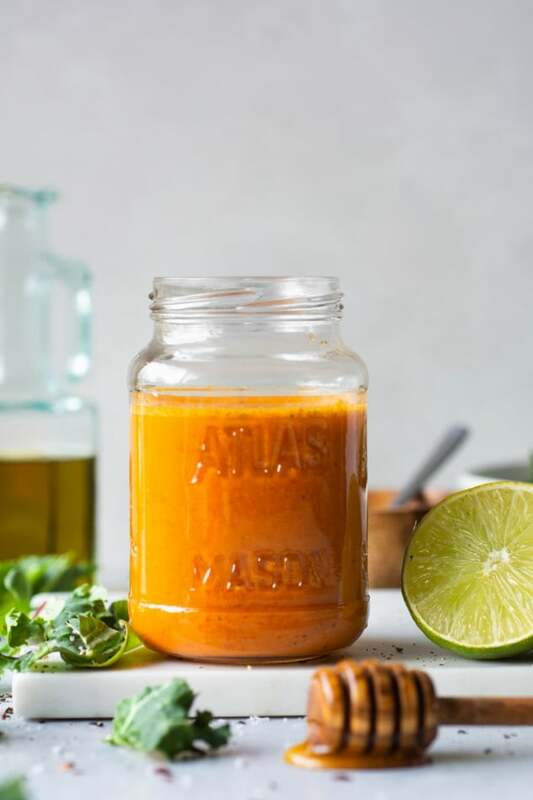 Like all fruits (and veggies), when roasted, the sugars in them start to caramelize, creating a more intensified flavor without adding any extra ingredients. The magic of cooking techniques is REAL, YO! Which ended up being the perfect cooking techinique for this recipe because I bought some strawberries from the store that LOOKED amazing but really just tasted like winter strawberries in the PNW. I should have known better. I guess the Spring (and really summer) produce idealist in me took over my thought process! But that didn’t stop my determination to make something truly delicious out of them anyways, and satisfy that craving that I had for that ripe juicy strawberry flavor. I already had some mint hangin’ out in the fridge that needed to be used up soon, cuz we all know how fast that herb can go from green and lovely to brown so quickly! So I instantly thought of pairing it with the roasted strawberries. 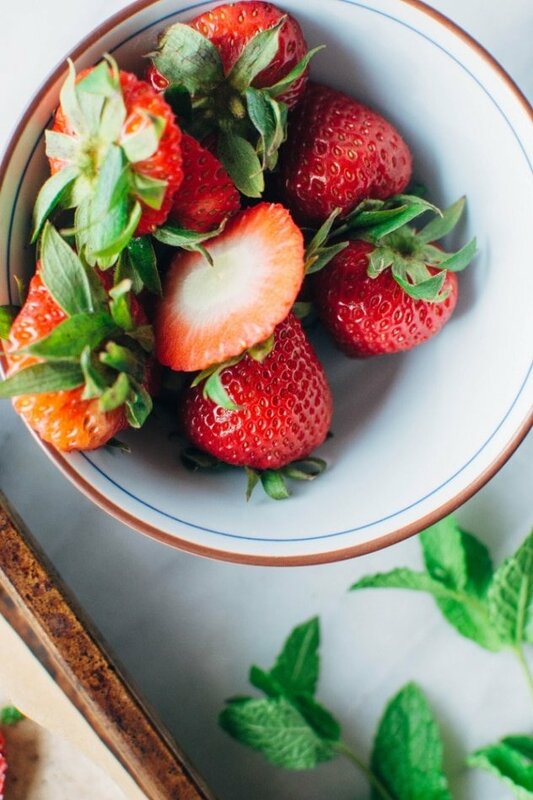 Strawberries + mint = match made in heaven. And I wanted to test out an idea that I had to whip up some yogurt with an egg white for a fluffy cream to pair with them. It turned out AMAZING! Not quite as thick as I had anticipated, but still very pleasant. 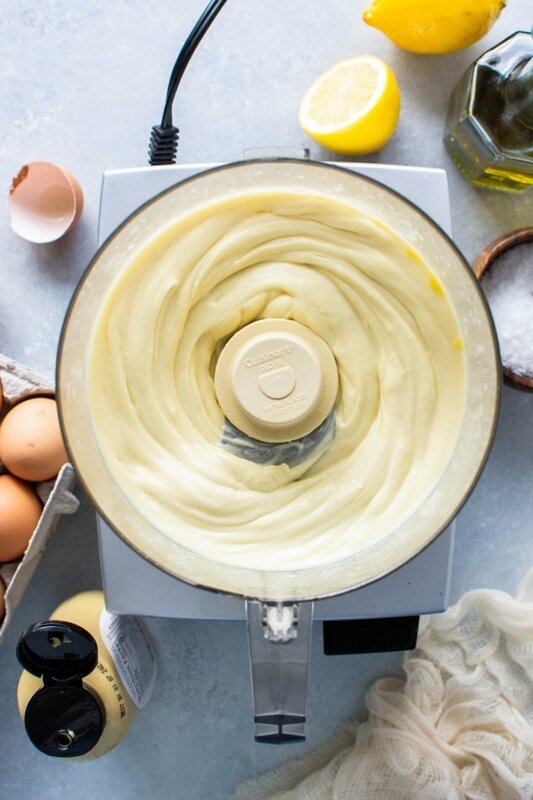 Think of an airy yogurt cream, like a whipped yogurt kefir. 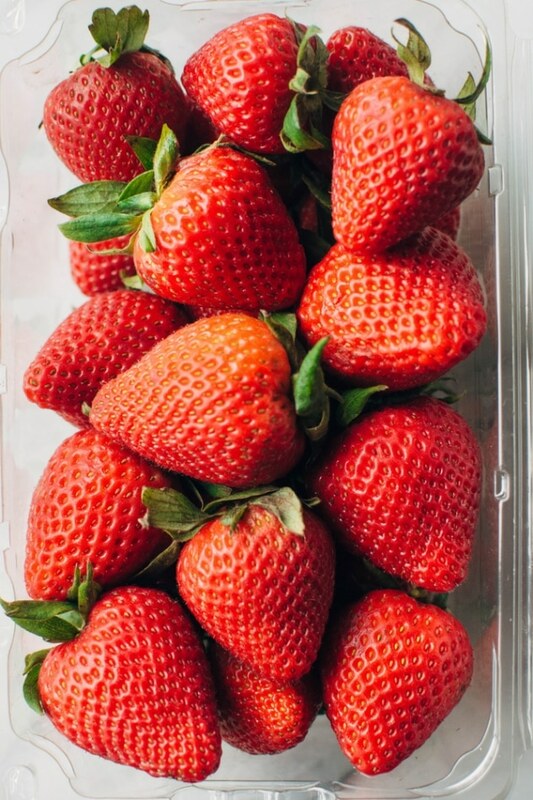 Such a good pair for the bright and sweet roasted strawberries. 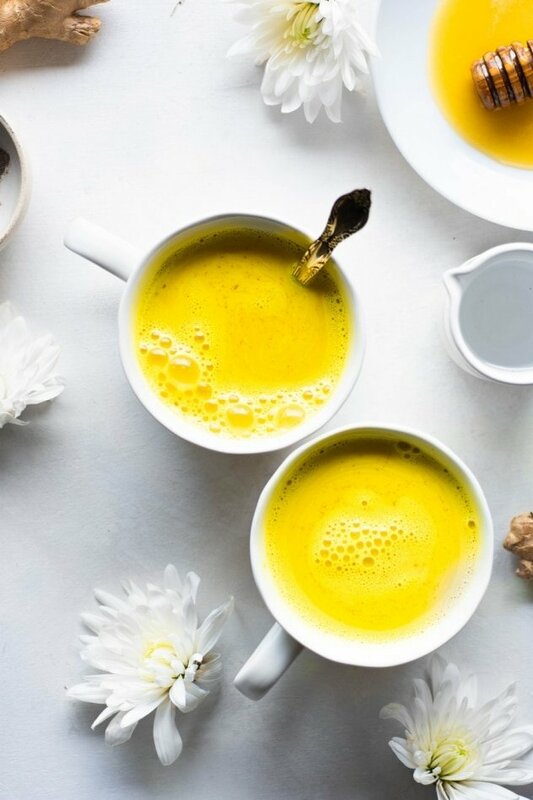 And wanna know something SUPER cool about this recipe? 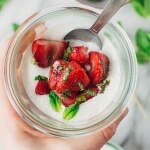 The strawberries are a PREBIOTIC (a food that helps create an ideal environment for beneficial bacteria to thrive in our digestive system) and the yogurt cream is a PROBIOTIC (a food that brings new and beneficial bacteria into our digestive system). So pretty much we’re talking a match made in heaven. I’m sure you’ve made the classic fresh berries + cream in a bowl combo during the hot months of summer when the berries are at their perfect ripeness, right? 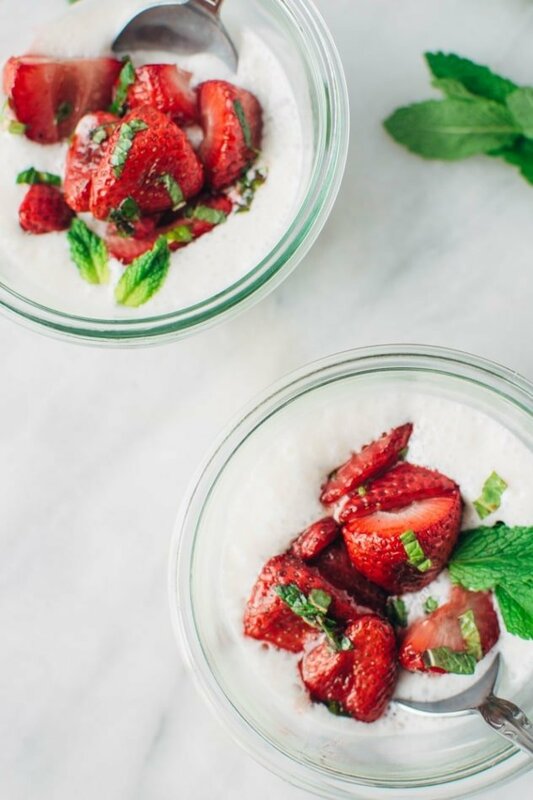 This little bowl of sweetness is basically a spring version of that – strawberries roasted to luscious perfection with a hint of balsamic to bring out the sweetness even more, tossed with some fresh mint to brighten everything up and paired with a tangier, slightly sweeter (probiotic rich!) creamy counterpart. So while I’m having a hard time waiting for the warmer months to get here and bring with them ALLLL the perfect strawberries, this sweet indulgence will totally hit the spot until then. 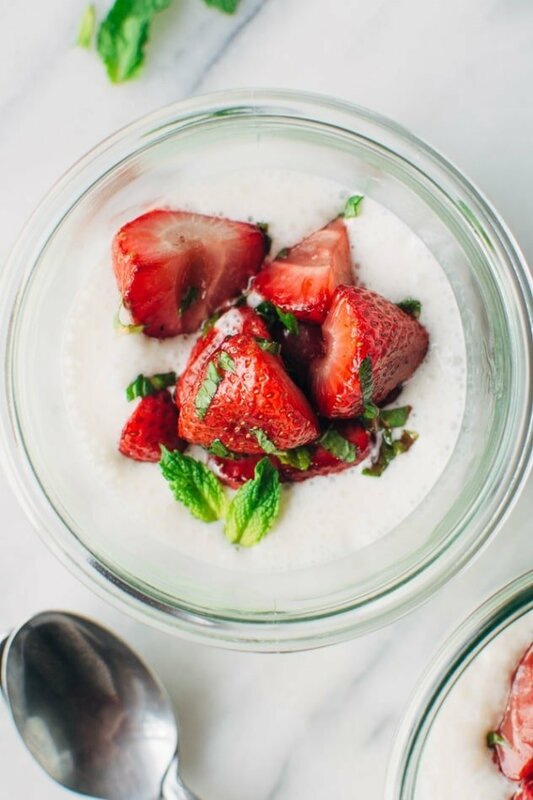 Roasted strawberries with mint and airy yogurt cream – A delightfully sweet and simple spring indulgence that’s refined sugar free made with balsamic roasted strawberries, torn fresh mint, and an airy probiotic rich yogurt cream sauce. Toss strawberries with avocado oil, maple syrup, sea salt and balsamic vinegar. Roast, face down for 10 minutes, until beginning to caramelize and soften. Flip and roast another 5 minutes. 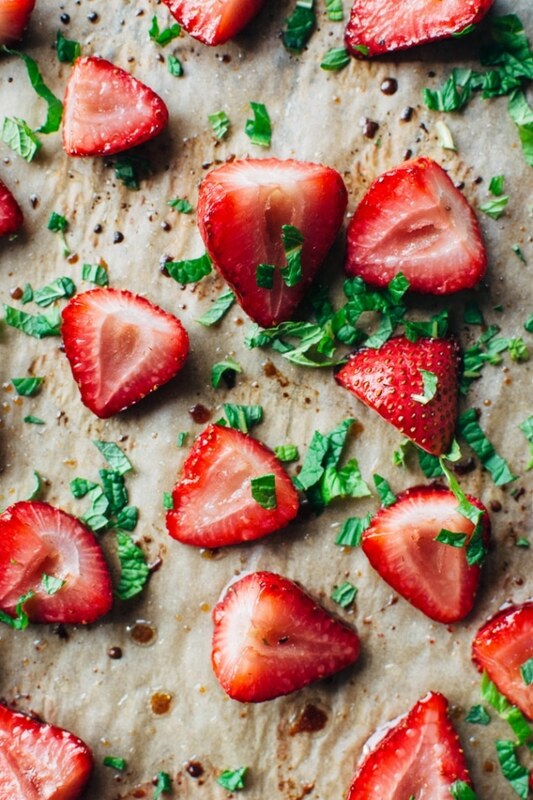 When strawberries have cooled, toss with chopped mint. 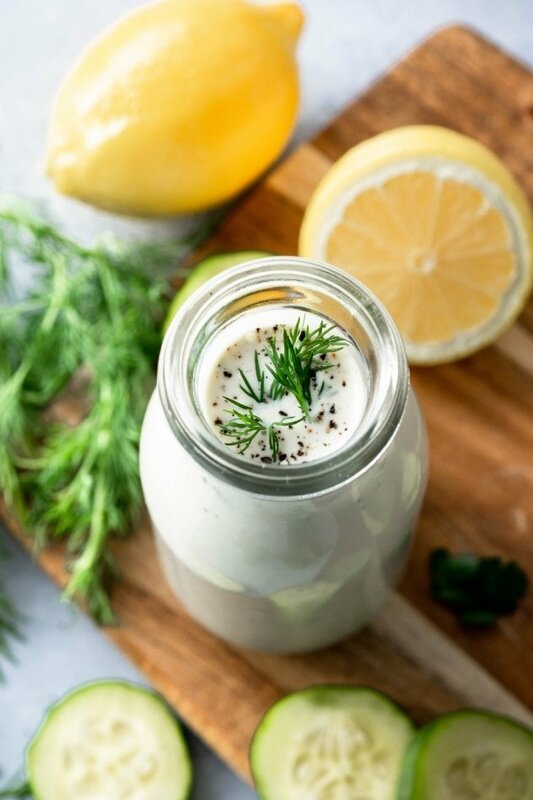 Process yogurt, maple syrup, sea salt and vanilla extract in a blender until well combined. Add egg white and 2 ice cubes and process on high for several minutes, until mixture is airy and light. 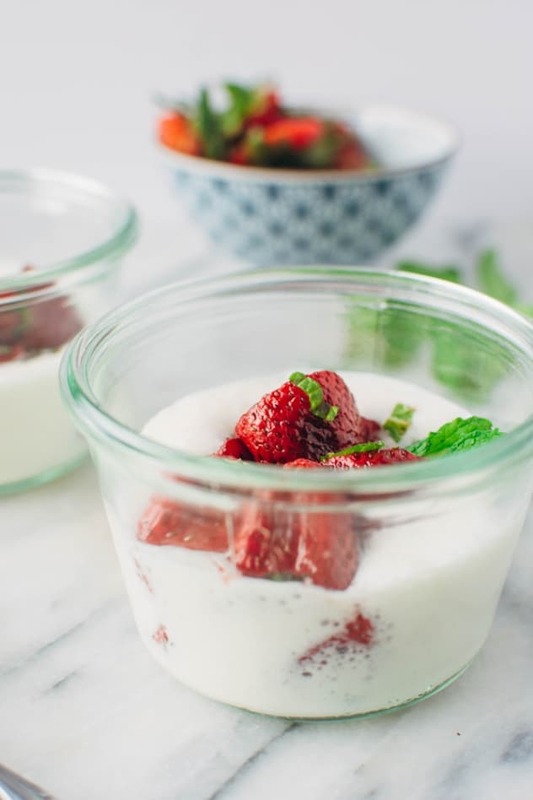 spoon some of the yogurt mixture into a bowl, top with strawberries and serve immediately! You will probably have some of the yogurt sauce leftover. In my experience it will actually keep in the refrigerator for several days, and maintain it’s airy quality. Can be paired with so many other yummy things – the only limit is your imagination! 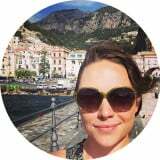 This entry was posted in snacks, sweets and tagged breakfast, dessert, easy, grain free, healthy, quick, strawberries, vegetarian on April 4, 2017 by Nyssa Tanner.